Upcoming food and drink happenings in SA, including this weekend?s Nutella Palooza, Madame Hanoi?s Chilli Festival and a Spanish-inspired lunch at Victor?s Place. 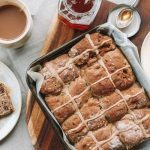 Traditional hot cross buns are given added spice with the addition of dried pear and chocolate chips in this recipe from the Adelaide Central Market. Kangaroo Island Spirits has launched a gin boasting 48 botanicals grown in its distillery garden - including juniper berries, which it says is an Australian first. One of Adelaide's most famous restaurants, Rigoni's Bistro, on Leigh Street in the CBD, has been placed in administration. The Barossa Valley?s latest attraction combines chocolate and wine in a sprawling new $5.5 million venue that takes inspiration from experiences offered by some of the world?s sweetest destinations. Upcoming food and drink happenings in SA, including a one-day vegan food showcase, West Torrens' Fire & Spice chilli festival, and Tasting Australia events. Tasting Australia highlights plus other SA food and drink events, including Beer & Bite festival, a Korean Chowdown at Fine & Fettle, and coffee cuppings at Exchange.